As a methodical paradigm the picture atlas has had a considerable influence on art history in the 20th century. The montage of picture rows on plates, as in Aby M. Warburg’s famous Mnemosyne Atlas, can also be found in legal archaeology, which deals with the visible and material aspects of law. Photographs as well as drawings and prints of objects and other evidence, legal architectures, signs in public space, decorations of legal spaces, symbols or allegories were collected to represent and commit to memory legal objects and customs from the neolithic until the early modern period. The visible normative dimension can also be reconstructed and visualised by way of the art historical photo archive. 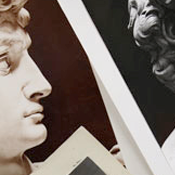 Together with the picture atlas they represent laboratory and workshop for art historians. Their mediality and mutability allow for the comparison and study of forms. 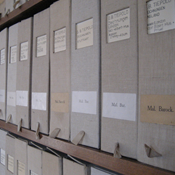 From the archive’s classification system, that is arranged chronologically, topographically or by period, pictures are singled out and rearranged in rows or clusters according to any conceivable principle. Through the clear arrangement of atlases knowledge can be expanded and defined more precisely both about the reality and through the fictionality of law. 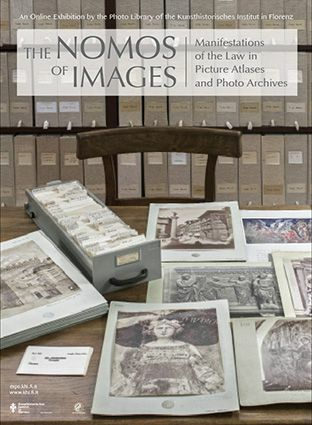 The online exhibition creates a reciprocal and mutually stimulating dialogue between the assemblage of images in different legal historical archives and the classifying organisation of the art historical photo archive of the Florentine Photothek to create new atlas panels that broach the broader issue of the visibility of the nomos (Greek for law, custom).